(2) Donations to that church ARE still automatically tax deductible. “The IRS states that a church is automatically a qualified organization, and therefore contributions are automatically deductible. You can deduct your contributions only if you make them to a qualified organization. To become a qualified organization, most organizations other than churches and governments, as described below, must apply to the IRS. Examples: The following list gives some examples of qualified organizations: Churches, a convention or association of churches, temples, synagogues, mosques, and other religious organizations. however churches are NOT required to file this application, and are automatically exempt. We already operate our church as a non-501(c)3 church and have no intention of applying. Our members contribute to the church without worrying about tax deductible receipts. However, the issue we are actually dealing with, is a specific person that wants to donate a very sizeable amount of money, but they want to be able to claim that donation as a tax deduction on their income tax return. We of course have no intention of applying for 501c3 status just to accomodate this person, regardless of the amount of money they want to give. We are looking for a legal opinion that can explain to this person that a church is automatically a qualified organization (per IRS own documentation) and donations are tax deductible even if the church has not applied for the 501c3 recognition (per IRS own documentation). First, let me commend you on seeking legal advice on this matter from an attorney who understands these matters instead of a “Christian” legal firm or lawyer who promotes church legal status such as corporate 501(c)(3) or 508 status; such attorneys and firms not only misunderstand the relevant legal principles, they also, and more importantly, do not understand the relevant Bible principles of church, state, and God’s desired relationship between church and state. Included in those firms are private firms, as well as firms such as the “Christian” Law Association, the Christian Legal Society, and many others. Even the Alliance Defense Fund has now joined ranks with them. It is big business, big money, and big power for those “Christian” lawyers and law firms who promote union of church and state. Why? Because incorporated and 501(c)(3) and 508 churches are a continuing and rich source of revenue for their unholy activities. They get payment or “gifts” from a multitude of churches and believers who have succumbed to their lies and manipulations. Their churches become part of the legal system and many matters disputed within their churches can be taken to their authority—the government courts. Who is needed for all those matters? Who is needed to advise them on how to write their constitutions, by-laws and other documents? Who is needed to advise them on how to conduct their affairs so as to counter feared government intrusions into their affairs? Who is needed by both sides of a conflict initiated by one faction of a church against another faction, or members against a pastor, or for other matters which one or more members may wish to take to their authority, to court? Lawyers and more lawyers are needed. They sustain themselves by sucking money out of incorporated 501(c)(3) or 508 believers and churches, money which could be used for the glory of God, as well as from other incorporated 501(c)(3) organizations such as The Church of Satan, The Church of Wicca, Planned Parenthood and the list goes on and on. the portion of Publication 1828 which you quoted: “Churches that meet the requirements of IRC Section 501(c)(3) are automatically considered tax exempt and are not required to apply for and obtain recognition of tax-exempt status from the IRS.” [Bold red emphasis mine]. Notice that a church that meets the requirements of IRC Section 501(c)(3) is automatically considered tax exempt. 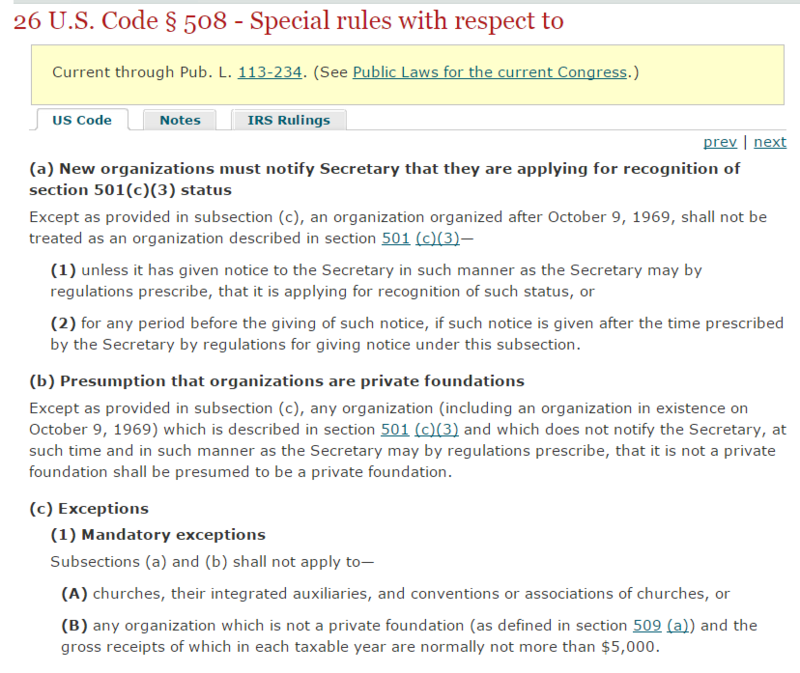 Section 508 of the IRC exempts churches from the 501(c)(3) filing requirement. A church who chooses to rely on 508 for tax exempt status is in the same position as a 501(c)(3) church—it is subject to the same rules and its authority for the matters covered by those rules is the federal government through the Internal Revenue Service. For more thorough explanation, see Church Internal Revenue Code § 508 Tax Exempt Status (042814). the entirety of the relevant IRS regulations. the laws upon which the regulations are based. The IRS regulations are written by the IRS to implement laws in the Internal Revenue Code, in this instance §§ 501(c)(3) and 508 of the IRC. However, other sections of the IRS come into play, such as § 170. For more on § 170 see Spurious rationale for church corporate-501(c)(3) status: tax exemption and tax deductions for contributions OR Tax reasons given for church corporate 501(c)(3) status: a biblical and legal analysis (Section VI, Chapter 8 of God Betrayed; Chapter 8 of Separation of Church and State). Keep in mind that that was written several years ago and there may have been modifications to the law since then. the relevant federal constitutional provisions and the history and meaning thereof—in this instance the First Amendment to the United States Constitution and the Fourteenth Amendment to the United States Constitution which is implicated because your church in an established church, a church incorporated under the laws of the state of incorporation. A First Amendment church is not a legal entity such as a corporation, an unincorporated association, an entity with employees, a staff, a a payroll, a constitution and/or bylaws, etc. Your church, as a legal entity has given up much of her First Amendment protection because she has submitted herself, against Bible principle and against the spirit of the First Amendment and corresponding state constitutional provisions, to civil government. the non-profit corporation law of the state of incorporation. That law may or may not, depending on the state, implicate 501(c)(3) and 508 considerations. The issue is one, not for your church, but for the donor. If you were not an incorporated church, I would charge you no fee. Since you are incorporated, I will advise you that you do not need to hire me, but if you wish me to do a complete written memorandum of law to prove my conclusions to you, I will do it for a charge. My advice at this point is that this is not a matter for your church to deal with. There is no charge for my advice to this point. 501(c)(3) and 508 status go to the church who claims them, not to the individual donors who are concerned with receiving a tax deduction for their “gifts.” You have made clear in our correspondence that you will not give IRS acknowledgements for gifts, no matter what, even if it means not getting a substantial donation. To claim 508 status violates your declaration as I will explain. Should the donor claim the deduction and state that he gave to a 508 church, the IRS will look to see if he has an IRS acknowledgement from the church for the donation. A church who claims 508 status is also agreeing to give IRS acknowledgements to the donor. As I mentioned above, giving an IRS acknowledgement for tithes, offerings, and gifts subjects a church to the rules that come with 501(c)(3), even if the church has not applied for the status. If the church is not 501(c)(3), the church, by giving the acknowledgement, submits herself to 508 status which means subjection to 501(c)(3) rules. Practically speaking, a church can submit herself to the regs and then violate them with little fear that the IRS or the government will enforce them, unless it is a high profile church who raises the eyebrows of the IRS, . The IRS does not have the resources to take on churches, nor do they have the inclination. In fact, The Alliance Defending Freedom has conducted more than one pulpit initiative over the years in which hundreds of pastors announced that they were going to preach on politics on certain dates and times in violation of one of the rules that come with 501(c)(3) and 508 status, did so, and even sent copies of their sermons to the IRS admitting that they had preached them in church giving the date and time they did so. The IRS did nothing. Those pastors and churches miss the point: they were hoping that their chosen authority, the Internal Revenue Service, would challenge what they did so they could present their unlearned arguments in federal court, ultimately the United States Supreme Court. They simply do not understand that even had their actions been challenged and even had the court ruled in their favor, they would still be losers because they voluntarily chose an authority over their church other than the Lord Jesus Christ. They had also lost regardless of the outcome of their endeavor because they were also incorporated under state non-profit corporation laws thereby subjecting their churches to those state non-profit corporation law for many matters. Nor did they understand that by incorporating and getting 501(c)(3) or 508 status they had removed themselves from First Amendment status only and placed themselves, as legal persons, under the Fourteenth Amendment. See 1,000 Pastors who pledge to defy IRS and preach politics from pulpit ahead of election misunderstand the law and the hierarchy of law (100312). So why is this important at all? Because the Supreme Ruler of the universe and our Lord and Savior Jesus Christ has made clear in His Word that He wants no other authority over His churches. He loved the church and gave Himself for it. The local visible church is the executor of His will and, as such, it to be organized and guided by His precepts alone. If the proposed donor wishes to claim a deduction for what he gives, then it is not the church’s battle. It is his, unless you join with him. The correct motive for giving to God is love for God, not getting a tax deduction. If one wants to claim a deduction, I cannot fault him if his attitude is that he is giving because he loves the Lord, not for the deduction and if he determines that he will give no matter whether he gets the deduction. I believe that one way a believer who is considering the tax deduction for giving can approach this is to balance the assets with which the Lord has entrusted him against his family duties and other obligations and figure out how much he can give without claiming the deduction so as to come out the same as though he were to claim the deduction. Then, give that amount and not claim a deduction. If he claims the deduction and the church will not give him and IRS acknowledgement, there are ways provided for in the Internal Revenue Code which allow him to claim without acknowledgement from the church [I explained this in a nutshell to the pastor—I leave that out of this article, but have explained it in my online writings.]. If he makes the claims and provides the required proof of the gift, the IRS may ask him to prove that the organization to which he gave was a church. Or, the IRS may disallow the deduction with or without such proof having been given. At that point, in my opinion, he has legitimate constitutional grounds to fight it out in court. For example, one argument that he can legitimately make is that it is contrary to the First Amendment for the government to prefer a First/Fourteenth Amendment church over a First Amendment church, a church that has chosen not to become a legal entity. In short, a church who has determined that she will not give an IRS acknowledgement for donations cannot claim 508 status because that would directly contradict her commitment. 508, in the event of audit of the taxpayer, requires an IRS acknowledgement from the 508 church and places the church in the same position as 501(c)(3) status. The 508 church has submitted to an authority other than the Lord Jesus Christ for some purposes. The pastor agreed that the fight should be that of the donor, not the church. He asked if it would be OK with me if he gave the person this advice and referred him to me. I agreed. I further stated that there would be a charge for my services if the donor wished a lengthy memorandum or even a lengthy oral explanation. The pastor pointed out that the consultation had taken over the fifteen minutes and that I could send him a bill for the extra time (I had offered him a free fifteen minute consultation). I told him there would be no charge. Why? Because I love the Lord and I love my neighbor and even churches and pastors who have dishonored our Lord by becoming legal entities. I loved this pastor because of his very humble, kind and considerate attitude toward me and the honor he gave me by calling on me for help. In the last month, I have spent many hours on the phone with a pastor of another church which is both corporate and 501(c)(3) concerning a legal suit against the church by a faction which had been disciplined out of the church. I ultimately told him to call a legal firm which handles legal matters for churches which are legal entities. I charged him nothing for all the time I gave him. Why? Because I love the Lord and I love my Christian brothers and sisters. I tell them the truth because my motivation is love for my Lord and for my brothers in Christ, not the love of money. God bless. must apply to the IRS. Hi Jerald, Can we setup a phone call on Monday? Maybe 8:30am PACIFIC time? Can you tell me the charges for your services? I cannot tell you what I will charge for my services at this point. I would be glad to do a 15 minute consultation with you at 10:30 a.m. Monday morning at no charge in order to get an idea of the extent of the time needed to research your issues and reach an opinion. If you wish to extend the time of that consultation, my fee is $150.00 per hour. to establish a church according to New Testament principles, that is a church under Christ in all things, a church ordered according to New Testament church doctrine? to avoid the rules that come with 501(c)(3)? all of the above plus ….? Please e-mail me your answer as soon as possible. After our talk, I will get back with you to know what my charges will be. If you want me to go forward once that is determined, I ask for payment in advance. Please note. 501(c)(3) and 508 churches are what is called “tax exempt.” They are not “tax deductible” as you indicated in your initial e-mail. First Amendment churches are non-taxable, not tax exempt. Much more needs to be said for full understanding. Monday at 8:30am will work fine for 15 minutes. And payment in advance is not a problem if we decide to go forward. Per your comments in your email, perhaps I have misread the IRS documents, but I look forward to talking on Monday morning. 1. What is a Spiritual entity? 3. Is a church a Spiritual entity, a legal entity, or a Spiritual/legal entity? 4. Is it illegal for a church in America not to incorporate? Does a church have to be a 501c3? 5. Does God Care if our Church is Incorporated? 6. Should a Church Be a 508 Church? 7. Does a church in America need an Employer (Tax) ID Number? 8. Did President Trump do away with 501(c)(3) Requirements? 9. What does church, inc. mean? 10. Who Is the head of an incorporated church? 13. What is the history of the First Amendment? 14. What is the History and Meaning of “Establishment of Religion” in America? 15. What is an established church? 16. What is a First Amendment Church?